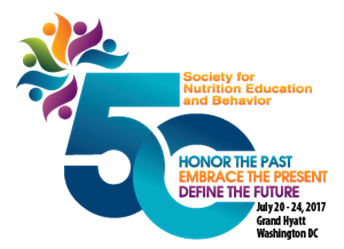 SNEB has received a resolution for consideration which has met the criteria according to the Issues and Resolutions Policy: Building a nutrition education evidence data base to support policy and planning in developing countries. A ballot was sent to all members on Monday, September 26, closing October 21. Email info@sneb.org to request a ballot be resent. A resolution is approved when at least 15 percent of the membership votes and the majority are in support of the resolution. Doing a presentation to students about SNEB? Thank you to Sarah Colby for sharing a PowerPoint presentation she recently created to encourage students to become involved with SNEB. Download here. Humans are biologically adapted to their ancestral food environment in which foods were dispersed and energy expenditure was required to obtain them. Learning to cook and having the opportunity to cook may provide a unique means for adolescents to develop life skills and contribute positively to their families. Future research examining the relationships between cooking and health may include measures beyond nutrition, such as social relationships and emotional well-being. Speaker: Arika Ligmann-Zielinska, Ph.D., is Associate Professor of Department of Geography within Michigan State University. Dr. Ligmann-Zielinska's research encompasses a broad range of modeling approaches appealing to public health policymakers. Agriculture Secretary Tom Vilsack announces the launch of the USDA Branded Food Products Database, a free online resource for families, the food industry and researchers containing nutrition details on more than 80,000 name brand prepared and packaged foods available at restaurants and grocery stores. Member Nancy Gaston served as an SNEB advisor to this project. Does glucosamine really help joint pain?